The Mud Lite Tires from ITP are designed for the rider who travels all types of terrain and occasionally wants to hit serious mud but doesn't want too bulky or heavy tires which can bog down the motor. Available in a wide variety of sizes. 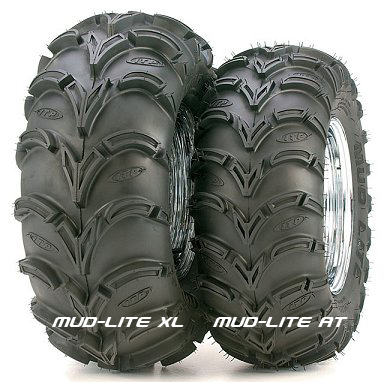 Mud Lite offers cutting edge technology, all around performance, long distance durability, and a smooth ride combined at one great price! Their design results from extensive hours of computer-aided engineering. These ATV Tires are a revolutionary design for all-conditions, yet can perform when conditions get slippery! One of the lightest Mud Tires available!